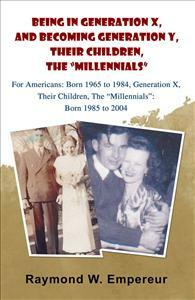 Being in Generation X and Becoming GenerationY is a new self-help book for and about Generations X and Y, the “Millennials”. Being in Generation X and Becoming GenerationY is a new self-help book for and about Generations X and Y, the “Millennials”. Gen Xers are adults that followed the Baby Boomers and were born from 1965 to 1884, and their kids, the Millennials, were born from 1985 to 2004. In 15 chapters, and just over 125 pages, the author covers a wide variety of topics of importance to the future well-being and success of people in both generations. We define the generations and offer important information on financial planning and many of the very issues that these generations struggle with and face every day.